Share the post "Album review: LEAVES’ EYES – Symphonies Of The Night"
There are a lot of female fronted symphonic metal bands out there now and a lot do tend to blend into one another, with a few notable exceptions and Leaves’ Eyes are one such exception. The soaring vocals of Liv Kristine are the key success to this band, that and the use of the darker vocals of Alexander Krull, best highlighted on the immense ‘Hell To Heavens’ – a perfect example of how to do symphonic metal properly. Elsewhere we have the folk metal of ‘Galswintha’; if this song doesn’t get you jigging about you must be clinical dead! ‘Saint Cecelia’ is another symphonic tour de force, building on keys and strings to an epic chorus. Krull is back to add his dark, menacing vocals to ‘Angel And Ghost’, whilst ‘Nightshade’ proves that you don’t need soaring vocals on every song – the musical arrangements on this are first class. 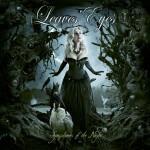 Leaves’ Eyes are one of the best symphonic metal bands out there and this album is possibly their best to date. The bonus CD adds two more songs including a cover of Depeche Mode’s ‘One Caress’. With a bit of luck this album will see Leaves’ Eyes ascend even further in the popularity stakes. This entry was posted in ALBUM REVIEWS, ALBUM REVIEWS (Mobile), All Posts and tagged Alexander Krull, German, Germany, Leaves' Eyes, Liv Kristine, Norway, Norwegian, review, rock, symphonic metal, Symphonies Of The Night. Bookmark the permalink.